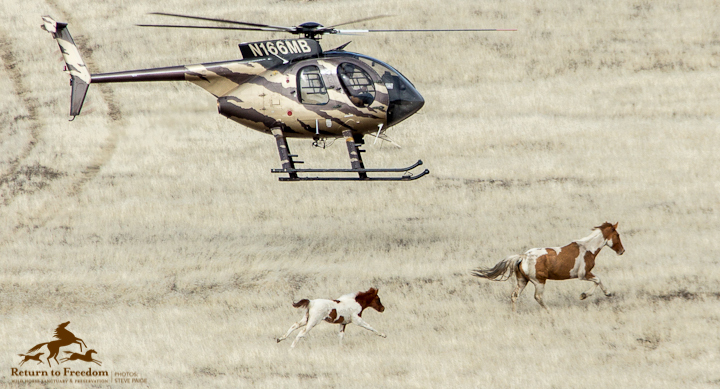 A mare and foal are pursued by a Bureau of Land Management contractor’s helicopter during the recent Cedar Mountain Horse Management Area roundup in Utah. Photo by RTF humane observer Steve Paige. Update: HCR 22 (Ivory) died in the Utah Senate on March 9. Federal management of wild horses has been a dismal failure, resulting in ecological and economic havoc on Utah’s public ranges, according to new legislation that seeks repeal of the 1971 statute protecting free-roaming horses and burros. Two bills and an appropriation request promote state management that envisions sharply reducing horse numbers through slaughter and permanent sterilization — measures sure to draw stiff opposition from horse advocates. But Utah lawmakers and county commissioners are fed up with the Bureau of Land Management’s approach, which they say allows horses to proliferate at the expense of range health, livestock operators and native wildlife while wasting $50 million a year confining horses that could be slaughtered for their meat. “The fragmentation coming out of D.C. is tremendous,” Rep. Ken Ivory, R-West Jordan, told the House Natural Resources, Agriculture and Environmental Quality Committee on Wednesday. “This is a hell for the ecosystem, it’s is a hell for the wildlife species, it’s is a hell for those on the ground who are told the solution is to cut back their livelihoods and their herds. It’s a hell for the animals themselves; they are starving and dying. Clearly we can do this better.” Ivory is the sponsor of HCR22, a resolution calling on the federal government to either take immediate steps to “humanely preserve the feral horse and burro populations in the West at established population management objectives” or cede that authority to the state. Horse advocates reject the premise of this measure, which is one component of a package of legislative actions targeting wild horse management. Rep. Keven Stratton, R-Orem, is seeking $1.1 million to manage Utah’s 19 herds, whose population now exceeds 5,000, or about 2½ times the BLM’s target. He is also sponsoring a bill that lays out a state management plan. Stratton and others have made it clear state management could entail slaughtering horses, but horse advocates say such proposals would face a buzz saw of controversy. But lethal population control is in line with positions advocated by Interior Secretary nominee Ryan Zinke as well as the BLM advisory panel, which urged the agency last September to offer “all suitable animals in long- and short-term holding deemed unadoptable for sale without limitation or humane euthanasia. Those animals deemed unsuitable for sale should then be destroyed in the most humane manner possible.” Advisory panel members said they were not endorsing slaughter for meat, but after a negative public reaction, the BLM pledged it would not destroy healthy horses and burros. Most horse-advocacy groups endorse PZP, but that is not the case with GnRH, or GonaCon, which they say has not been proven safe. “GonaCon interferes with the animals’ reproductive hormones and could negatively impact natural behaviors. It is important to preserve these natural behaviors since that is what distinguishes wild horses from their domestic counterparts,” said Suzanne Roy, executive director of the American Wild Horse Preservation Campaign. Killing healthy horses will raise far bigger objections. The practice is allowed under the 1971 Wild Free-roaming Horses and Burros Act, but current federal regulations will not permit Department of Agriculture inspectors to sign off on horse meat. Utah lawmakers want to change that so meat from Utah horses can be sold. “There is a need for the animal protein worldwide but because we don’t allow a federal inspector to inspect packing houses we have not been able to utilize the resources we have,” Sen. David Hinkins, R-Orangeville, said at a Feb. 9 appropriations committee meeting. Kathrens noted there are no U.S. slaughterhouses that handle horses, so animals marked for slaughter would have to be exported. The last time a buyer shipped wild horses to Mexico, more than five years ago, the public outcry was intense and the Interior Department put a stop to it. Utah lawmakers said the state Division of Wildlife Resources has developed a detailed horse management plan, but DWR Director Greg Sheehan said the plan has yet to be fleshed out since there are so many unknowns about how much authority Utah could get. He said long-term warehousing of horses is not an option. “That could cost millions of dollars. Our state is not interested in doing that,” Sheehan said. He suspects that destroying horses could be the humane thing to do if it prevents herds from starving. County commissioners complain that, under BLM management, horses are suffering on ranges that have become depleted due to overpopulation. Horse advocates say it’s ridiculous to blame horses for range conditions when cattle outnumber horses by as much as 9-to-1 on the West’s public ranges. They agree corralling horses for life is too costly and ineffective, but they would rather see the BLM do more on-the-range management, principally through administering PZP with dart guns, obviating the need for roundups. Wild horses occupy about 2 million acres in Utah, or about 10 percent of the BLM land open to livestock grazing.